Happy Victoria Day everyone! In my books, any opportunity to have a holiday and spend some quality time with loved ones is ALWAYS a good thing and welcome idea. So thank you Queen Victoria! 🙂 What’s not to love about fireworks, shopping, dinning out, going to the movies and having a relaxing day with family and friends? 1. Victoria Day (in French: Fête de la Reine) is a federal Canadian public holiday celebrated on the last Monday before May 25, in honour of Queen Victoria‘s birthday. 2. Queen Victoria became Queen of the United Kingdom on June 20, 1837 and reigned until her death on January 22, 1901. Victoria is still the longest-reigning monarch of the United Kingdom. 3. The monarch’s birthday has been celebrated in Canada since before the beginning of Queen Victoria’s reign. After her death, in 1901, May 25 became known as Empire Day. 4. In 1952, Empire Day was moved to the Monday before May 25 and since 1953, the official birthday of Queen Elizabeth II has been celebrated on this date in Canada. So ‘Victoria Day’ is also the day to officially celebrate the birthday of the reigning monarch. 5. In 1958, Empire Day became known as Commonwealth Day, which was moved to the second Monday in March. The Monday before May 25 then became known as Victoria Day, which is now a Canadian statutory holiday and what we celebrate today! 6. Did you know that Queen Victoria inherited the throne at the tender age of 18? 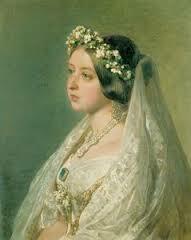 She married her first cousin, Prince Albert of Saxe-Coburg and Gotha, in 1840. Their 9 children married into royal and noble families across the continent, tying them together and earning her the nickname “the grandmother of Europe”. The Victorian era was a period of industrial, cultural, political, scientific, and military change within the United Kingdom, and was marked by a great expansion of the British Empire. 7. Another fun tidbit: Queen Victoria has been credited with starting the western tradition of white bridal gowns, although she was not the first royal to be married in white. During her wedding n Feb 10, 1840, she selected a white dress, fabricated from heavy silk satin, which was considered an unusual choice at a time when colours would have been more usual. The lace used for her wedding dress proved an important boost to the Devon lace-making and to future royal wedding attire. At the time, Victoria’s choice was criticized since she did not wear many jewels, velvet trimmed with ermine, or a crown, and the color was unusual. Wearing white was quickly adopted by wealthy, fashionable brides, even though white had been a distinctly uncommon choice for bridal gowns before Victoria’s wedding! (Note to self and young ladies around the world, be like the young Victoria and be unique in your style and fashion…an original beats someone who blindly follows trends and the ‘popular’ Joneses). Once again, wishing you all a Wonderful and Happy Victoria Day!! ← Month 5 – A Fitness Journey: Your Weight Is Important!